The Empire seeks to create sectarianism and ethnic divides in a country that, prior to the Western-launched criminal dirty war, had neither. • They seek to attack the constitution by means of a so-called “transition” stage. • They seek to destroy the two pillars of the government: the army and the diverse, national, pan-Arab and religious identity of Syrians. • They seek to rebrand the savage terrorists as “moderates” and then to eternally provide them with a cover of legitimacy. • They seek to create chaos, sectarianism, and ethnic enclaves that turn the people’s commitment from the homeland to conflicting groups that seek help from foreigners against their own people. • They seek to be branded as “humanitarian” and “protectors” to save the people from (externally engineered) conflict and misery. By imposing economic and armed terrorism on Syrians, by waging a phony war against their own terrorist proxies (including ISIS and al Qaeda), by creating sectarian and ethnic tensions, and by destroying Syria’s infrastructure — including water and electrical infrastructure — the Western, Zionist, and GCC agencies of terrorism seek to be perceived as saviours, humanitarians and protectors, who can then introduce the “free market” of international capital, which will be the coup de grâce to affect the final destruction of the host country. And mainstream fake news provides the criminal warmongers with on-going, 24/7 cover to commit their war crimes. Syrian-American Sarah Abed was born in Syria and has lived in both the USA and Syria throughout her life. She makes frequent trips back and forth. Sarah is in direct daily contact with family and friends that reside in different parts of Syria. Sarah conducted and translated an interview with a local man named, “Samir”, who lives in AlQamishly, Syria and is well informed about the conditions on the ground. Question: What was life like in Al Hassaka prior to the launch of the dirty war on Syria? Answer: Life was great. The diversity was a positive attribute to the area. Al Hasaka is influenced by the Turkish, Syrian, and Kurdish cultures. You would see Turkish soap operas on local TV. , hear Turkish music, along with Merdali, and other types in the streets, blaring from the speakers of cars. I used to go to the music shops and pick up the latest Turkish songs. There were many restaurants, hospitals, hotels, and outdoor parks. Kurds had assimilated into the culture. They were considered Syrian citizens. Many of the Christians had family in Sweden. They would come for the summer. There were good relations between all of the different ethnicities and religious affiliations. It was hard to distinguish who was who in the streets. There was a bustling social life and people were generally content with their lives. Question: Did the Kurds have equal opportunities for education, healthcare, and work? Answer: Since the 19th century when most of the Kurds came into Syria there was a peaceful coexistence. Kurds lived and interacted with Muslim and Christian Syrians. Yes, they had equal rights in every sector. They attended schools with the Syrian government approved Arabic curriculum. They had access to free education, free healthcare just like their Syrian counterparts. They were, in fact, Syrian Kurds and were not treated any differently. Question: Are the people in Al-Hasaka well educated? Well informed? Answer: Yes, they were considered to be among the most educated people in Syria. They are also very conscious of what is happening in their country as well as abroad. Education was very important and they took pride in it. Many had completed college. Kurds represent about 30% of the population in the Al-Hasaka governorate. Question: How does the rest of the population feel about Kurdish aspirations for independence from Syria? Answer: Syrians are not entirely surprised by these recent demands by the Kurds for autonomy. They are however upset by it. Syrians feel that the Kurds were allowed to come in and have lived in Syria for centuries and were treated fairly, therefore, the need to now take a part of the country and claim it as their own federation is quite frankly an insult to the hospitality they were shown. They feel as though the Kurds are being unappreciative and are only looking out for their own interest and not taking into account the Syrians that live in the area. Kurds are the minority yet their demands for autonomy and to take over the areas that they have alleged are now their property is very unfair to Syrians in the area. Kurds moved into Syria and called it home, but now they are acting like the Syrians in their areas are living in their federation and need to abide by their rules and share their views and follow their commands or else they will be driven out of their homes. This is a very harsh and criminal way to treat others. Lest we forget that Kurds are ultimately nomads and their alliance lies with Israel. Question: Do all Kurds in the area want independence from Syria? Answer: In the beginning of the war the Kurds fought alongside the Syrian army, they were paid, armed, and trained by the SAA. When the USA came in and basically created the SDF Syrian Democratic Forces that’s when the Kurds became more adamant about wanting independence and autonomy. This is a very important point that needs to be made clear, The USA’s involvement in Syria led to the Kurds demanding autonomy. Had the US military not given them weapons, training, armed vehicles, and most likely paid them wages as well there is a good chance that the Kurds would not have made these demands. Not all Kurds want independence but those who speak up against it are silenced and told to not say anything or else they will be sent out of the country. They have received threats that saying anything negative about the Kurdish desires for autonomy will have negative consequences. Question: Why do they want independence? Did Assad government not treat them well? Did the U.S government promise them support? Answer: They have always wanted to establish Kurdistan, that has been a lifelong desire of theirs. They are originally nomads that moved into countries such as Syria, Iraq, Turkey but their origins are in Iran. It was brought up from time to time but recently it has been discussed more openly and adamantly. It has now become a demand and one they will stop at nothing to achieve. This is quite problematic and many people in the region are waiting to see how this will unfold. It is surely a battle, the end results are unknown. The Kurds were treated well and did not have any issues with the Syrian Government. They had equal rights, free education, free healthcare like the rest of the Syrians. Many do not have a passport which makes traveling legally an issue but it doesn’t seem to be a big concern for them. Question: How have the illegal Western sanctions on Syria impacted the Al-Hassaka area? Answer: The illegal sanctions have had a detrimental effect on the entire country. Due to its location in the North East of the country at times it felt like the Hasaka province was cut off from the rest of Syria. It was not receiving any sort of shipments from the other parts of Syria and had to rely on goods coming in from Iraq that were originally made in Turkey and Iran such as food, oil, rice, sugar, sanitary products, children’s items such as diapers and formula. At some points during the war, the only thing they were receiving from inside of the country was medicine coming from Damascus, even this was cut off during certain periods. Medical concerns and issues have multiplied and caring for illnesses and health conditions has become a big concern. It is both very expensive and also very difficult to find medicine and items such as infant formula. Another concern is that medical equipment has now become outdated and most of the machines do not work. Spare parts to repair them are unavailable. Most people with severe health conditions have had to move out of the area. The price of everything has multiplied. In 2015-2016 people had to rely on whatever products, food, healthcare, medicine, and everyday products that were already in the stores.. nothing else was being brought in. The demand was still there but the supply was dwindling and that, of course, caused severe economic turmoil and inflation. Another issue related to the sanctions is that right now there are no exports from Syria, which in turn made the price of the dollar rise which then had a negative effect on everything else. For instance, the price of infant formula had reached 5,000 syp which is about 10x what it was worth before.. some people were stating they are willing to pay 10,000 syp for a few days of formula but even that was difficult to locate in the stores. For the past few months, they have been receive more medicine. Question: What do other people in the governorate think about the Mandatory Self-Defence Duty and the prospect of killing Syrian soldiers? Answer: In Al Qamishly they have had a few conflicts between the SAA and the Kurdish soldiers. The last one was nine months ago and it lasted for four days. Right now they are not having any issues, but there is tension and it could break out into a fight at any time. Last time they killed four Syrian soldiers, and at that time there were Arabs who said they would no longer fight against the Syrian army, and they gave up their weapons and left the SDF. They refused to fight against the Syrian soldiers. When they are taking over new areas they are forcing the people in the new area to fight along with them. There were a few families in the villages that refused to fight along with them and they kicked them out of the villages and claimed that their homes now belong to the Kurds and they are not to return and claim their properties in the future. Question: What happens if citizens refuse to fight the SAA? Are they threatened? Answer: As mentioned previously yes, the ultimatum is either fight with us or you will relinquish your property and move out of town. They have already done this numerous times. Question: Which country is paying the Kurdish soldier wages? How do they receive payment? Are they paid better than SAA soldiers? Answer: Initially when they were fighting alongside the SAA it was the Syrian government that was paying their wages. Then the USA got involved and they formed the Syrian Democratic Forces on October 10th 2015. Right now we are not certain who is paying their wages, but it is assumed that the U.S is the one providing them with money since we know that they are providing them with weapons, training and armoured vehicles. Question: Are some of the Kurdish leaders criminals? Answer: Many of the local leaders didn’t hold any titles or ranks before the war, they didn’t have any army or political experience. They were not educated or well to do and most of them were in fact troublemakers with prior criminal convictions. These are on the local level. A differentiation needs to be made between the local leaders and their followers and the ones that came from Qandal Mountains in Turkey. On the local level yes they were smugglers and it’s been said that some are in the drug business. They loitered and stole items from the shops and homes in the areas they took control over. They were considered thugs. The ones that are coming from Qandal mountains have political and military experience. Question: Can you tell us about the SDF? Answer: First, I want to say that it’s not what the USA is trying to make it out to seem. The USA needed to support a group of people in Syria that did not have direct ties to terrorist groups. They did this after their union with the Free Syrian Army and “moderate rebels” fell through when it became clear that these were nothing less than terrorists and had ties to Al Qaeda and Daesh. The allies of SDF are the USA, France, UK, and a number of other smaller groups. Their headquarters is in AlQamishly. They state that they have about 50,000 fighters but we are unsure of that. They are mostly Kurdish and recently just a few days ago a large number of fighters defected from the SDF. They are led by the People’s Protection Units (YPG) and their goal is to create their own federation in the NE of Syria. There are US forces embedded with the SDF forces. The Pentagon confirmed the arms, ammunition, rifles, mortars, and ammunition it sent to them. The USA is heavily funding them and recently stated that they would continue to train and equip forces of the Manbij Military council. Sarah’s interview with Samir was a process that extended over a period of time, and she has amplified and clarified some of his commentaries. What is clear is that the US and its allies, in particular, Turkey, in this case, are committing crimes of aggression against the sovereign state of Syria beneath the Big Lie of combatting terrorism. The real plan, which is self-evident in this overview of the Kurdish issue, is to divide, conquer, and destroy Syria through economic and armed terrorism. When a family chooses to leave, terrorists are quick to occupy their house and to claim ownership. Featured Image Source: Picture of Komala fighter Emad in Aleppo. 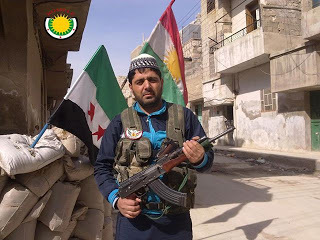 He is a member of the Kurdish FSA-group Komala seen here with both the FSA and Kurdish flag. “President al-Assad: Our war on terrorism continues, we will liberate every inch of Syria,” Syrian Arab News Agency, 7 June 2016. (http://sana.sy/en/?p=79525) Accessed 1 March 2017. By presenting themselves as democrats and fighters for justice and human rights, the Benefactors (Jesus’s description of those he said we are not to imitate) in power who lie, murder and plunder condemn themselves. They know what they are and they know they are evil. By selling those ‘leaders’ to us as democrats etc, journos, historians, campaign managers condemn themselves for the same reason. Well said…recently I wrote a much more in depth Analysis about the Kurds. Parts I and II are on my site. I wrote them for Mint Press News but they have been re-published by a number of other sites. I would love to hear your feedback on them. Also, I just read your article and will be sharing it on social media if that’s ok? I will tag Mark and Eva as well. 🙂 thank you. Thanks. Yes, l’ll check out your other material. I just discovered, and linked to, your blog. And feel free to share anything that originates with me with anyone you want. Keep up the good work! As I’ve pointed out elsewhere, and once it became crystal clear to me (thanks to Stephen Gowans’s recent, indispensable book on Syria), the Kurds are following very much in the footsteps of Nazi Israel. The fascist Israelis (and not all Israelis are fascist, but most are) were put through hell by Germany, and that did absolutely nothing to make them better people who would never do that to others. The Kurds were put through hell by Turkey and have now made a deal with the US, who needed non terrorist forces (for credibility purposes) to help with the destruction of Syria in return for lebensraum, showing that they’ve learned absolutely nothing positive from their treatment at Turkey’s hands. They jumped at the chance to have the promised lebensraum for their service to the world’s biggest terrorist state, turning themselves into terrorists, ironically. Assad should get very tough with the Kurds (and will have to get tough with Kurds who are innocent as well – for now – as he won’t know who is who), kicking them out of Syria and killing those who resist with force. I know that he is reluctant to do that. Score one for lawless, vicious uncle Sam, for the minute Assad acts to protect the national security of Syria, the entire Western corporate owned press will howl that it’s forces need to do humanitarian intervention.